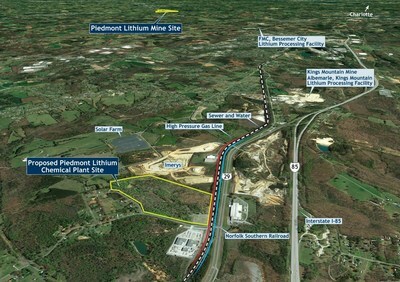 Piedmont Lithium Limited ("Piedmont" or "Company") (ASX:PLL; NASDAQ: PLLL) is pleased to advise that the Company has acquired a 60.6-acre parcel in Kings Mountain, North Carolina as a potential site for its planned lithium chemical plant. This acquisition represents an important step in the development of the vertically-integrated Piedmont Lithium Project located in North Carolina, USA. The lithium chemical plant site is approximately a 20-mile truck haul from the Company's proposed spodumene mine and concentrator, minimizing the freight cost for concentrate delivery to the proposed facility. Zoned heavy-industrial, the plant site has direct access to a Norfolk Southern rail line, Interstate I-85 and US Highway 29. The site also has natural gas and power transmission immediately adjacent to the property. The site will be included in the Company's scoping study which is on track for completion in Q3 2018. The planned lithium chemical plant will convert Piedmont Lithium-produced spodumene concentrate to lithium chemicals, with a focus on battery grade lithium hydroxide. Lithium hydroxide commands a pricing premium relative to lithium carbonate, and recent studies have reported that lithium hydroxide produced from spodumene has a production cost advantage relative to production from brines. 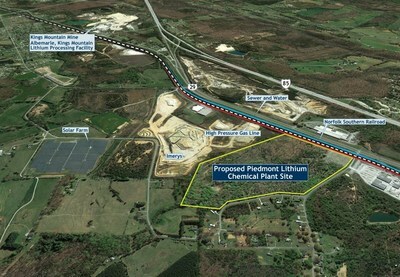 Piedmont Lithium will commence permitting of the lithium chemical plant upon completion of the Scoping Study. Keith D. Phillips, President and Chief Executive Officer, said, "We are very pleased to have identified such an attractive site for our downstream operations. The site is a short drive from our core mining and concentration properties, it is the proper scale for our contemplated lithium chemical production operations, and it offers all the infrastructure one would seek for such a facility. Piedmont is focused on building an integrated lithium chemical operation in North Carolina, and this site will be an integral part of our plans."